If you are looking for high-end high-fi headphones, you’ve come to the right place. Today we’re going to take a gander at what Cowin E8 Wireless Headphones can do, we’ll talk a little bit about the brand, after which we’ll share our impressions regarding the numerous performance tests we’ve put the E8 through. Without any further ado, let’s get straight to it. Cowin E8 is an Active Noice Canceling, Wireless, Over-ear Headphone. A very good successor of Best Selling Cowin E7 Headphone. In essence, Cowin is a relatively young brand. They were founded in 2006, but they’ve made quite a boom on the market. Cowin was first to introduce vibration-driven Bluetooth speakers. They have over 100 patents and boast a wide array of innovative technologies, which is just one of the reasons why we’re recommending the E8 to you. When we discussed with Cowin about this E8 Headphone Review, They sponsored us a sample copy of Cowin E8 Headphone and HE5A In-Ear Wireless Active Noise-canceling Headphone. Thanks to Cowin for such help. In a nutshell, Cowin’s E8 stands for a set of headphones with a hi-fi soundstage and impeccable Active Noise Cancellation technology. However, there’s much more to them than just that. Our “performance evaluation” section is here to help you get a better look at E8’s design, noise canceling technology, the improved airplane mode (improved in comparison to E7 Pro and earlier models), hi-fi sound, Bluetooth connectivity, and more. The first thing we notice about E8’s design is the ultra-soft set of ear cushions. These cups are medium in size, and they cover the ears without imposing too much pressure. What’s more, let’s also note that the headband connectors are slightly curved, moved away from the band so as not to pinch the ears of the wearer. These small details are easily neglected, but they mean a lot in terms of comfortability. Furthermore, the over-ear cushions can swivel up to 90 degrees, so you can rest assured that they’ll fit just fine, regardless of how big ears the wearer has. Additionally, both the band and the cups are very light, so we can wave ear fatigue goodbye. The brand also states that they’ve added new, exquisite materials which boast magnetic absorption properties, aiming to further boost the overall comfort level. Each color option is, suffice to say, beautiful in its own right, so make sure to check each of them out. Cowin has first released the E8 Headphone in 14th April 2018. Before Cowin E8, their most popular headphone was Cowin E7. 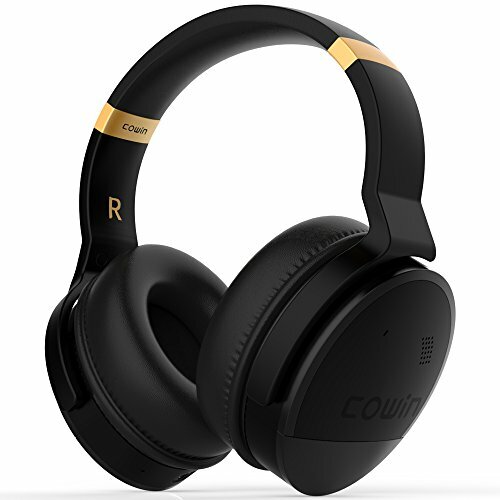 Between this two fantastic wireless headphones, they had an upgrade of Cowin E7 to Cowin E7 Pro which was also upgraded in 2018. Cowin used 45mm Large-aperture driver here for this headphone though they haven’t revealed driver size of previous headphones. Sensitivity levels of E8 are ≥100dB much better than E7 and E7 pro. When it comes to Frequency Response, E8 has an industry standard of 20HZ-20kHZ but as this is marketed for higher-end hi-fi headphone, the frequency could have been a bit better. They have made a huge improvement in the battery here in E8. 545mAh Li-ion battery for a headphone is just superb. It will take maximum 2-3hrs for a full charge and with ANC on, this can give a 20hrs of music. If you turn off the ANC, you can have extra few hours as well. Now, the noise canceling technology Cowin used when they manufactured the E8 is truly remarkable. The “active type” noise canceling tech substantially reduces the outside noise, helping the wearer focus on the music without external disturbances. It’s not just the ANC technology that’s “responsible” for eliminating outside noise – it’s the ear cushions as well. Namely, these two features combined reduce any and all noise you don’t want to hear. Lastly, the “active” stands for “switchable”. You can turn the noise cancellation technology if and whenever you feel like it. For example, if you’re on a trip abroad and you don’t feel sure about when you should get off the metro or bus, turning it off while still being able to enjoy your music might really come in handy. Also if your ANC is turned off and you are still using the Bluetooth for listening, you’ll save some battery charge here. We’ve come to one of the most important spheres of performance – sound. While it’s true to that most high-end hi-fi headphone models deliver the sound of outstanding quality, each model features a different soundstage. When we’re talking about Cowin’s E8, you’ll easily notice why they’re different from all “conventional” high-end headphones. Namely, the entire soundstage is pumped up a bit, especially the bass, but all within the range of sounding pleasurable. Of course, you’ll be able to toggle the level of volume at any point in time, but the punchline is that you can go a bit higher and enjoy in the bass and beats at a totally different level. The highs are also remarkable, although the midstage isn’t exactly pronounced. When we’re talking about the Bluetooth function of any headphone model, we’re talking about easy connectivity and cable-free convenience. That’s exactly what Cowin’s E8 provides. You can use this feature to make your calls without using hands or to skip your songs and adjust the volume. On another, note, there’s a built-in microphone onboard which allows you to speak without having to take your E8 headphones off from your head. These two features combined will easily make you forget about the “traditional” way of making calls, that’s a given. We have tested Cowin E8 to connect with Samsung Galaxy S8 and MacbookPro pro and we believe it will be similarly easy to connect with any other Bluetooth device. This is easy steps to connect with any android phone. Follow these steps and you should be good to go. After your turn on your headphone, wait 5-7 seconds and your phone should have E8 in available devices list under the Bluetooth app. Again click on your headphone’s power button. Your headphone speakers will say “Pairing”. You’ll see “Pairing” in your phone’s screen and that should be it. Connecting with your MacBook or any other laptop is also the same or easier. You need to turn on your Headphone and MacBooks’s Bluetooth app. After that, you’ll see E8 in the device list with a “Pair” button. Click on the Pair button and you are connected with the headphone. Enjoy the awesome music now. Fundamentally Cowin E8 is a Wireless Headphone, but this has a 3.5mm aux cable jack to plug your headphone with any music playing device if you don’t want to use Bluetooth. For example, you forgot to charge the headphone and drained all power. Now you still can listen to music with already included 3.5mm aux cable. For charging, there is a mini USB port to charge your headphone with an already given USB cable. Other than that, there is a Power button to power on, off and pair your phone with a Bluetooth device. You need to keep holding the power button for 5/6 seconds to turn it on. When power/Bluetooth is on, a LED light will blick in blue color to indicate. Also, a lady voice will give notification in the headphone speaker. Volume buttons are for increase/decrease volume and change tracks. Lastly the Golden color switch (not a button) is to turn on/off your Active Noise Canceling function. If this is turned on, a Green LED light just beside the switch will indicate its on. The E8 headphones come outfitted with a 545mAh battery which is easily rechargeable. Even with all of the convenience features turned on (such as active sound cancellation and Bluetooth) allow you to enjoy in your music for up to 20 full hours. That’s a lot, even by high-end headphones standards, but that’s not all. You won’t have to purchase another battery for your headphones for years, if not decades, as the one that comes supplied to E8 is famous for both reliability and longevity. As you’ve mentioned a few times already, Cowin’s E8 over-ear headphones are high-end headphones. That means that they provide a plethora of benefits, but that also means that they do not come cheap per se. These headphones belong to the medium bracket of the “boutique” price point category, but it’s safe to say that they’re far more valuable than most people would assume. As an argument to such a bold statement, we’ll run a brief comparison of E8 and E7 Pro, the latter being an earlier version from the same series. This is the list of the Cowin Accessories comes with the package. Cowin E8 vs E7 Pro – what’s new and why should you consider Cowin’s E8? Even though they’re from the same series, Cowin’s E8 and E7 Pro aren’t exactly alike. Namely, there are a lot of differences between them, both in terms of price, functionality, design, and overall value. In order to show you the full extent of Cowin’s E8 value, let’s see what upgrades have the earlier model “suffered”. Several Cowin headphone models can be used during airplane flights, but their engineers and technicians have made an extra effort to improve the details models prior to E8 have lacked in this sphere. While the active noise cancellation takes out most of the ambient noise, the magnetic absorption ear cushions will take out the feedback and static you might experience while listening to your music on the plane. The headband connectors of earlier Cowin headphone models were way too rigid for comfort, and they’ve often clamped or pinched the ears of the wearer. The arced design of E8 takes care of this issue and substantially boosts the overall comfort rating. The ANC technology was used on both models, but E7 Pro leaked “more sound” into the wearer’s ears. While even the E8 isn’t capable of eliminating 100% of ambient noise, it’s substantially better than the earlier version. Now, this might not be a huge deal, but people who frequently commute or travel will have a better experience with E8. This particular model feels better, offers more comfortability, as well as additional options which allow you to customize your listening experience more easily. To further bolster our aforementioned argument, the E8 is also slightly more portable than earlier versions in the same series. It’s lighter and just a bit smaller altogether. As the brand states, the E8 is some 25% stronger when compared to E7 Pro, let alone even earlier versions. That, of course, regards not only the bass but the entire soundstage in general. The highs are full of character, and the lows are deep and thumpy. On a downside, the mids aren’t exemplary with both E8 and E7 pro. The earlier version of Cowin’s headphones from the E series had a great microphone onboard. However, some people report experiencing static and minor feedback every once in a while. Cowin’s engineers made sure that this issue is resolved when they built the E8 model. Even though we’ve mentioned plenty of reasons why Cowin’s E8 is great (if not one of the best headphones within the price range), there are still a couple of things that leave just enough room for improvement. The snug fit means less ear fatigue, but it also means that your ears will sweat a bit more frequently. The overall breathability of E8 is inferior to that of E7 Pro, even though they’re made of similar materials for the most part. While we’re still on the “snug fit” issue, let’s also add that the clamping force of E8 is higher than E7 Pro. Namely, the E8 features a clamping force of 1.2 pounds while the latter has only a single pound. The term “clamping force” here refers to the amount of force the ear cups impose on the wearer’s ears, and though the difference is only 0.2 pounds, it’s still something you’ll feel eventually. Basically, E7 Pro is more rigid than E8. It’s less versatile, less compact, and it’s just a bit harder to use altogether. However, due to its rigidness, it’s also slightly more durable. Be it as it may, this difference doesn’t mean anything if you apply regular and thoughtful maintenance of your headphones. Now, aesthetics aren’t really a part of our “performance check”, but if you’re already paying a fortune for your headphones, wouldn’t it be cool if they looked good all the while? Since we’re already using E7 Pro for reference, let’s just say that this particular model came in six color options, whereas the E8 comes in only three. On the upside, Cowin’s E8 is, without any doubt, better looking in general. There are a couple of matching color stripes with Cowin’s brand name embedded in the headband, as well as a pair of plain ear cup protectors. Now that we’ve discussed each aspect of Cowin’s E8 performance, let’s have a quick check of each field. Starting with design, we can safely conclude that these headphones are made of premium quality materials. The shape of the band and the cups, as well as the innovative headband connectors only contribute to our initial impressions. The Cowin’s E8 design rating is 4/5. Let’s move on to noise canceling technology. Active and switchable, the ANC tech used in the manufacturing process of Cowin’s E8 is impeccable and exquisite, to say the very least. Only the most relentless of noise-makers (such as natural disasters and such) will be able to interrupt your music listening experience. The Cowin’s E8 noise cancellation quality rating is 5/5. How headphones sound is, perhaps, the single most important thing we consider. Now, E8 features a remarkably balanced soundstage powered by bleeding-edge drivers, although the middles aren’t as pronounced. Regardless, the Cowin’s E8 Sound quality rating is 4.5/5. A good battery is important if you prefer wireless headphones over corded ones. These headphones can almost an entire day, and the bat is fully rechargeable, hence the battery quality and lifespan rating of these headphones are 4.5/5. We’ve mentioned Bluetooth headphones, and a good connectivity is imperative if they’re to be dubbed as “reliable” in any sense. The Bluetooth and microphone quality of E8 headphones is 4/5. In all fairness, Cowin’s E8 headphones are simply a bit better than most models within the price range. There’s plenty of bass, the active noise cancellation technology this brand uses is bleeding-edge, to say the very least, and to top it all, they’re exceptionally comfortable to wear, even during the longest of trips. Now, let’s be frank, there are several things that leave room for improvement, but it doesn’t get much better for the money. In comparison to Cowin’s earlier models, the E8 comes on top with great ease. In conclusion, if you have the means to save up enough cash, there’s no reason why you shouldn’t at least consider it. A well designed, perfectly build wireless active noise canceling over-ear headphone under $200 and most of the time $50 discounted in Amazon, which makes it $149.99 priced Headphone is just amazing. There's no question about sound quality considering the given price point. Bluetooth and ANC work just great. The size of the headphone is just a bit big but should not be an issue for most of the people except if someone is a bit short in size. If you are planning for a Wireless Active Noice canceling headphone with this price point, this is the best one.